Clip Art and Black and White Download with 10 Color Images and 6 Black and White Images. All images are high quality 300 dpi for beautiful printing results. 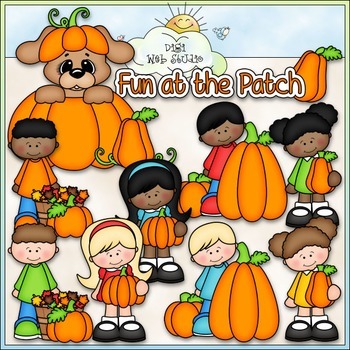 Includes: 1 dog inside a pumpkin, 1 boy with a basket of fall leaves and a pumpkin (2 versions), 2 girls holding pumpkins (2 versions), 1 boy in a pumpkin patch (2 versions), 1 word art of: FUN AT THE PATCH (with a pumpkin attached).